What happens to stocks and bonds when interest rates rise? 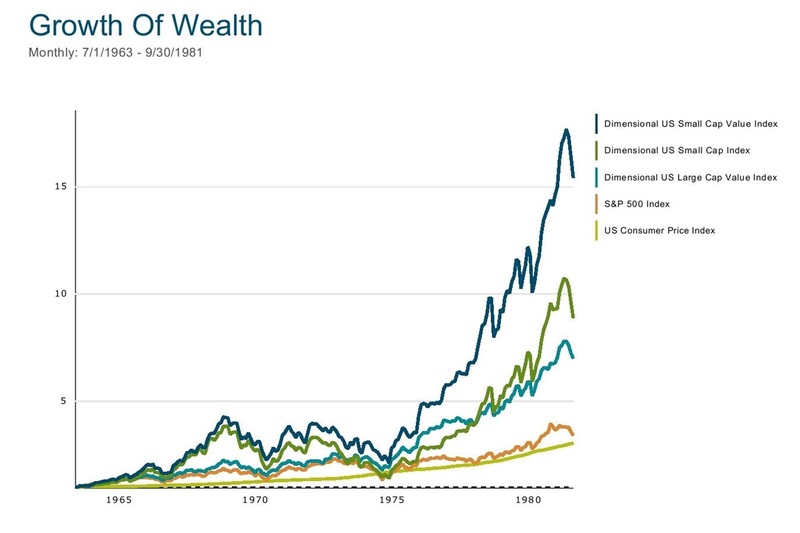 We can't say for sure but like most aspects of investing, looking at history can give us some idea. The yield on the 10-year Treasury Bond peaked in September of 1981 at 15.3%, unbelievable by today's standards as it sits just below 3% and bottomed at 1.5% in July of 2016. But back in 1963, interest rates weren't much higher than they are currently. Yields crossed 4% in July of 1963 and never looked back, marching steadily higher over the next 18 years. The chart below looks at various bond maturities to see how they were affected by rising interest rates and inflation. The rate of inflation from 1963 through 1981 was a staggering 6.3% per year, meaning that every $1 in 1963 only bought $0.31 worth of goods just 18 years later. 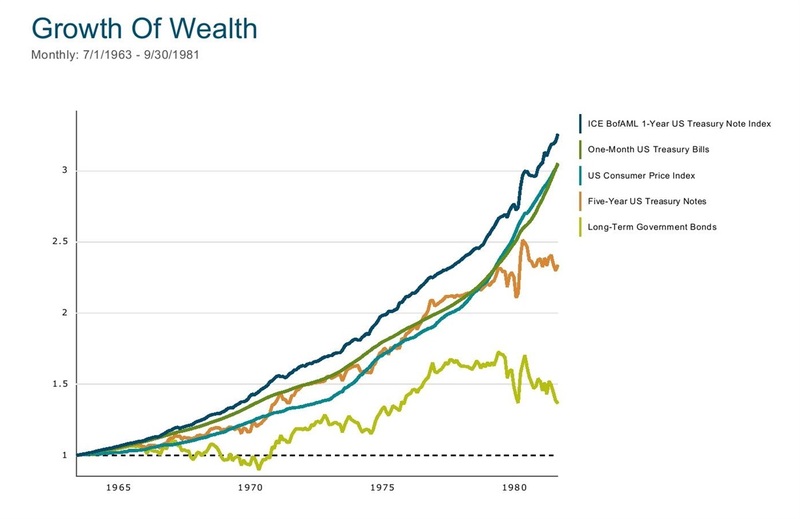 If your investments didn't keep pace with rising consumer prices, the purchasing power of your wealth went down. For most bond maturities, this was the case. Rolling over 1-month Treasury Bills managed to keep pace with inflation, earning +6.3% per year. Extending maturities out to one year did slightly better at +6.7% annually. Five-year maturities held in until the late 1970s, producing an annualized return of +4.8% per year, about 1.5% annually less than inflation. Long-term bonds are where the real carnage took place -- a static 20-year maturity bond portfolio earned just 1.7% a year, 4.6% annually less than inflation. Every $1 invested in long-term bonds in 1963 was worth only $0.43 net of inflation by 1981. On an inflation-adjusted basis, this is a far worse decline than anything we've seen from US stocks in the last century. What about stocks? Like bonds, it was a mixed bag. The large-cap S&P 500 Index barely managed to outpace inflation, earning +6.9% per year. Other asset classes fared much better. Large value stocks ("Dimensional US Large Value Index"), those trading at below average price-to-book value ratios, averaged +11.3% per year. The smallest 10% of stocks in the market ("Dimensional US Small Cap Index") did even better, earning +12.7% per year. And the lowest priced small-cap stocks ("Dimensional US Small Value Index") performed the best, with a staggering +16.2% per year return, outperforming inflation by almost 10% per year. How should investors use this information in the design of their long-term portfolios? By remembering Mark Twain's famous quote, "history doesn't repeat, but it often rhymes." After a 35-year stretch of declining interest rates, it is easy to become complacent and assume that longer-term bond maturities offer a riskless return, or surmise from more recent times that simply holding a large-cap index is sufficient for your stock allocation. But other periods remind us that extending bond maturities is a very real risk, and one that very few investors with inflation-sensitive future obligations should take; keeping maturities to five years or less is a much better policy. By keeping bonds short and safe, investors can then look to stocks, and not riskier bonds, for higher potential returns. Within the stock market, we see that even during difficult times, it's reasonable to expect smaller and more value-oriented stocks to generate higher returns; sometimes these higher returns can be the difference between earning a positive inflation-adjusted return or just squeaking by. If you would like to know how your current portfolio could be impacted by higher inflation or interest rates, or more generally if your asset allocation makes the most sense for your long-term goals, don't hesitate to reach out for a second opinion. Past performance is not a guarantee of future results. Index and mutual fund performance includes reinvestment of dividends and other earnings but does not reflect the deduction of investment advisory fees or other expenses except where noted. This content is provided for informational purposes and should not to be construed as an offer, solicitation, recommendation or endorsement of any particular security, products, or services.